In the world of luxury full-size sport utility vehicles, the 2019 INFINITI QX80 is the “crown jewel”. Here at Red Noland INFINITI in Colorado Springs, we are proud to offer this stunning new 2019 INFINITI QX80 LUXE to our customers! With three luxurious rows of leather-wrapped seating and best-in-class technology, this QX80 is perfect for the whole family. This elegant Hermosa Blue crossover is also loaded with the best industry-leading options available. Sporting a powerful 400-horsepower 5.6-liter V8 engine, this beautiful INFINITI has excellent capability to transition from daily highway driving to steep mountain grades. The QX80 can take you and your cargo anywhere! An efficient 7-speed automatic transmission with Adaptive Shift Control “learns” your driving style and adjusts automatic shifting accordingly. The all-wheel drive powertrain provides essential traction control whether driving in icy conditions or maneuvering on a rough mountain trail. This INFINITI QX80 LUXE is the ultimate all-purpose vehicle! Entering the cabin of this amazing SUV, every detail has been designed to elevate passenger comfort. The driver and front passenger will enjoy their commute with climate-controlled Graphite leather seats. Passengers in the second row will appreciate heated Captain’s chairs while enjoying a movie on the DVD screens embedded in the front-row headrests. The third row offers spacious seating for three adults. A 15-speaker premium Bose Cabin Surround Sound system offers incredible audio that the whole family will adore. The convenient power liftgate allows easy accessibility to the cargo area whether hauling groceries or gear for your weekend camping trip. When hauling precious cargo such as family and friends, safety is at the forefront of our minds. The engineers at INFINITI have designed the 2019 QX80 with some of the top driver safety aids in the industry. Drive this amazing INFINITI with confidence with convenient Lane Departure Warning/Prevention, Backup Collision Intervention, Blind Sport Warning/Prevention, Distance Control Assist, AroundView Monitor, Predictive Forward Collison Warning, front fog lamps, and front and rear parking sensors. 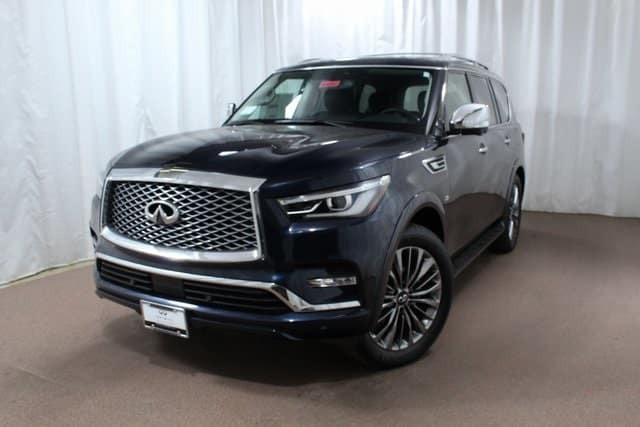 This safety-focused 2019 INFINITI QX80 LUXE has every safety “bell and whistle” you can thing of! Well-qualified purchasers can finance this elegant 2019 INFINITI QX80 LUXE with an APR of only 1.9% for 60 months. Let our expert financial department at Red Noland INFINITI assist you with the financing of your new QX80 today!